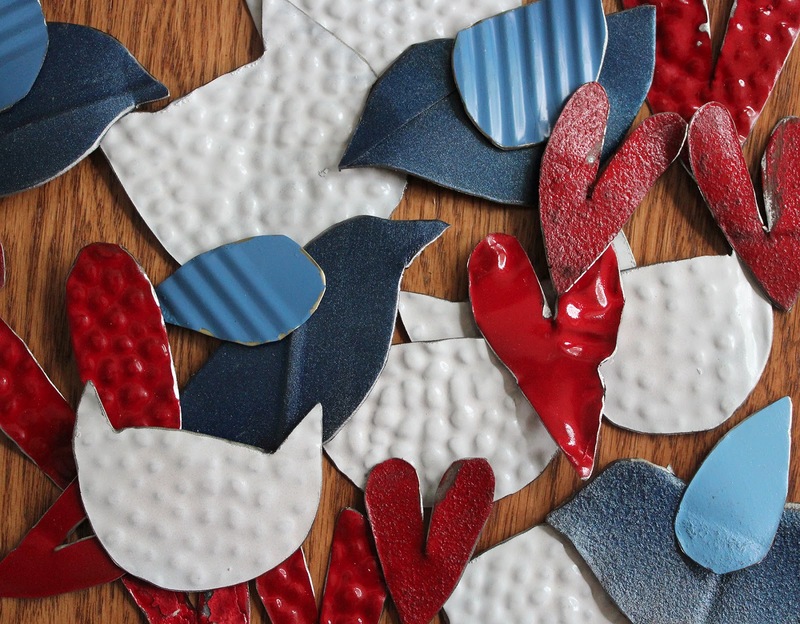 LEAF PLATTERS-SPAS FOR THE BIRDS! Birds love to have water nearby in every season, but in the summertime, they seem to especially enjoy water for frequent drinking and refreshing splashes. A leaf platter water basin is ideal for this purpose because the water is shallow and the decorative leaves attached to the side made the perfect sundeck for the birds to preen and relax. 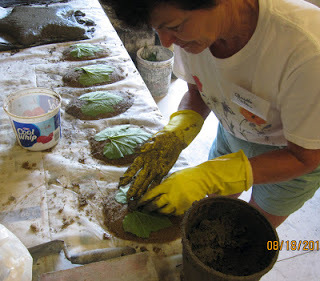 In our Hypertufa Studio you learn to make your own leaf platter. 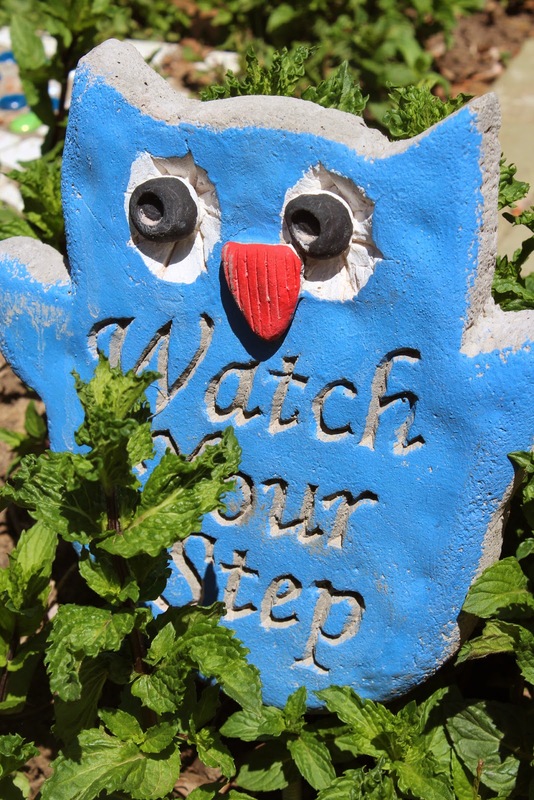 This is a creative, fresh twist on typical bird baths and a point of interest in your garden that's far and above typical bird bath projects. 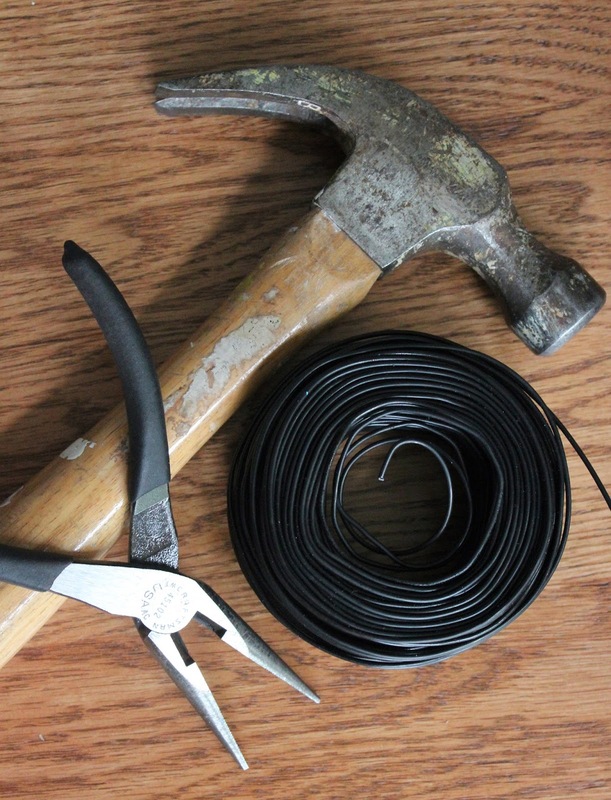 You begin with a stroll through the gardens to collect the leaves you'll use in your casting. My favorite leaves for this project are hydrangea leaves because they can be found in multiple sizes are tough and have deep veining on the back. 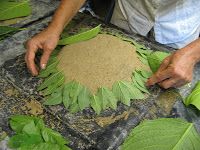 We cast individual leaves on smaller mounds of sand to use as the ornaments for the leaf platter. The leaves are arranged face-side down on a mound of damp sand. This hump of sand makes the bowl shape to hold the water in the finish water basin. 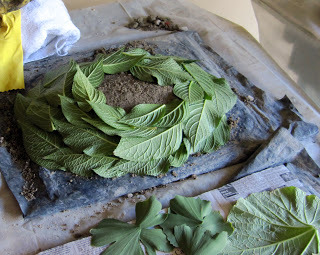 The leaves can be arranged in an accidental or an ordered fashion. Once the mound of sand is covered with leave and thin layer of concrete is pressed onto them to hold them down and capture a perfect impression of their shape and veins in the concrete. 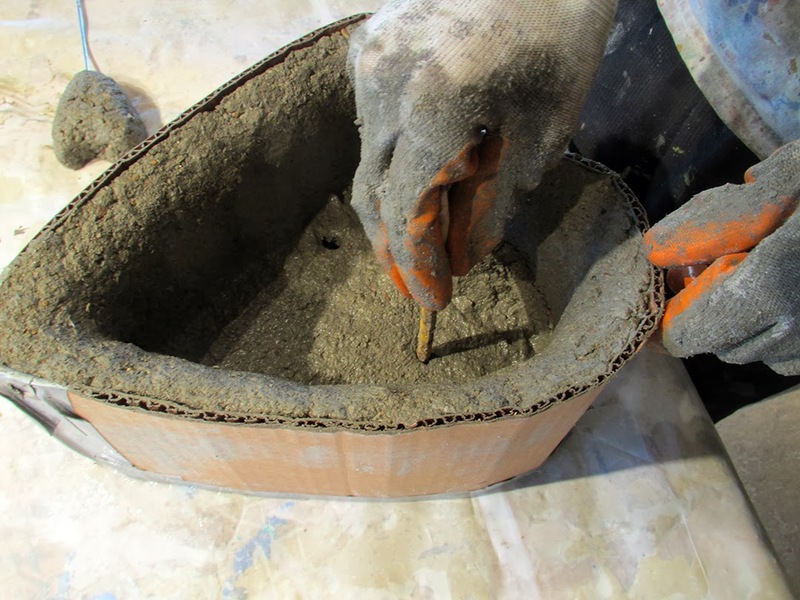 To finish the platter, a thick layer of hypertufa is patted onto the layer of concrete to add support and shape the outside of the plater. The "sandwich of the concrete and the hypertufa make a perfect combination. The concrete captures the leaf detail and allows the basin to hold water. The hypertufa adds shape and heft without the weight.Usually basin bottoms are left plain but here old rosette irons were used to stamp a design in ot the bottom and wine corks were inserted as feet.Lyn used huge hosta leaves forger large elegant basin. 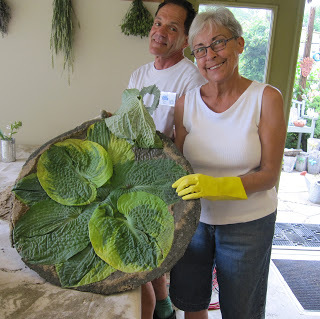 Caroline and Chris had us make this custom super large leaf basin. 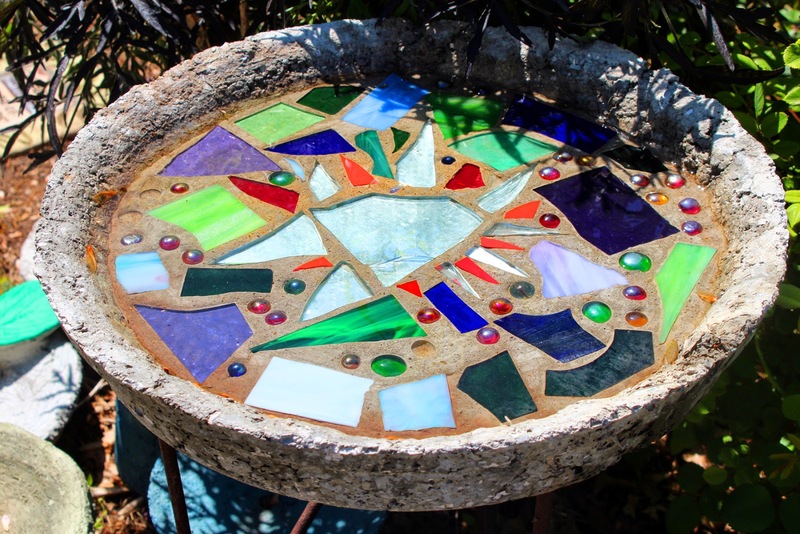 It makes a stunning water feature with or without a fountain and pump!Don't miss the chance to make your own leaf platter this summer. 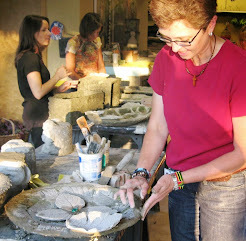 Join us in one of our Hypertufa Studios at From the Summer's Garden. Get sign-up info here! This is a great way to reconnect with old friends or enjoy your own personal "staycation." 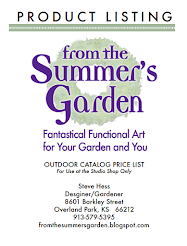 The Garden Studios at From the Summer's Garden are held during our Spring Sale and conducted by our artists. It give cusotmers a chance to join in on the creative fun. 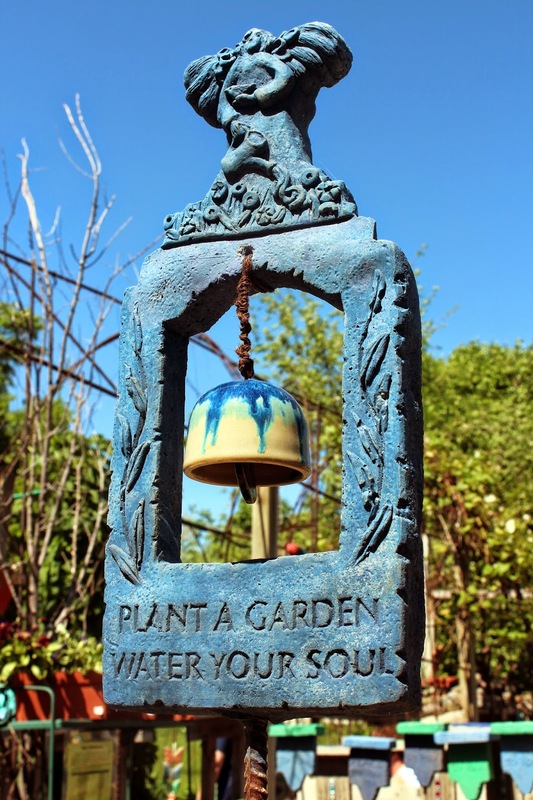 Our final weekend for A GARDEN OF GOOD wil be this coming Memorial weekend, Friday, Satuday, Sunday and Monday and we'll be open 10:0-5:00. John Cain from CainFusions absolutely LOVES their large spoon rest because it will handle any and all of your utensils in the kitchen. 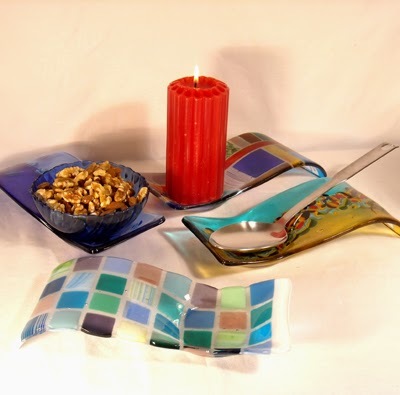 It can also be used as an elegant candle holder or used to nest a coordinated colored bowl into one when entertaining. Sleek, contemporary, & safe to run through the dishwasher! 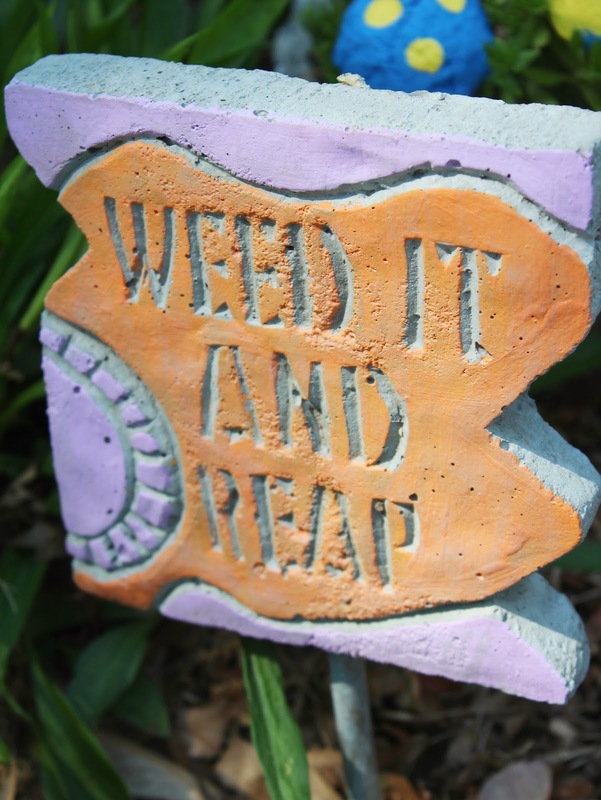 Now available at A GARDEN OF GOOD! 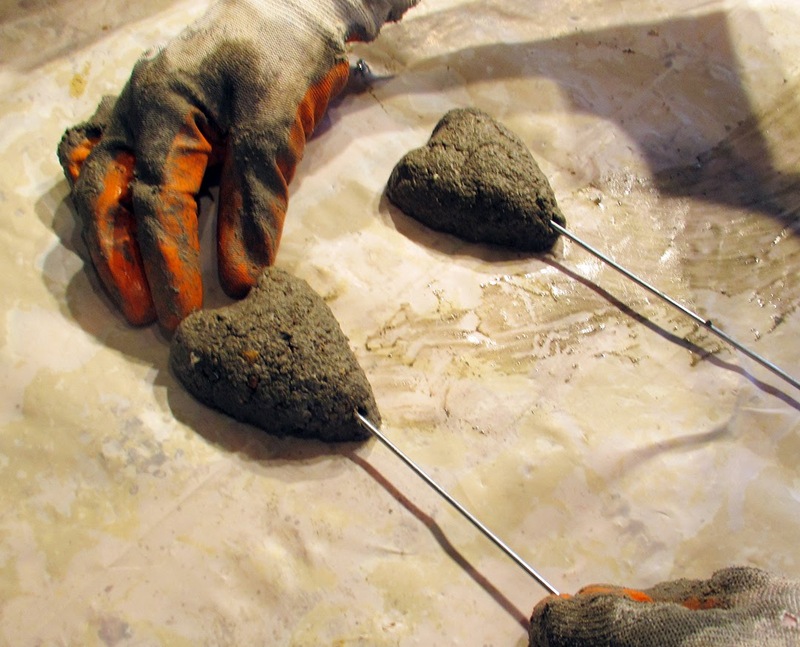 COME AND MAKE THIS TUFA HEART PLANTER! 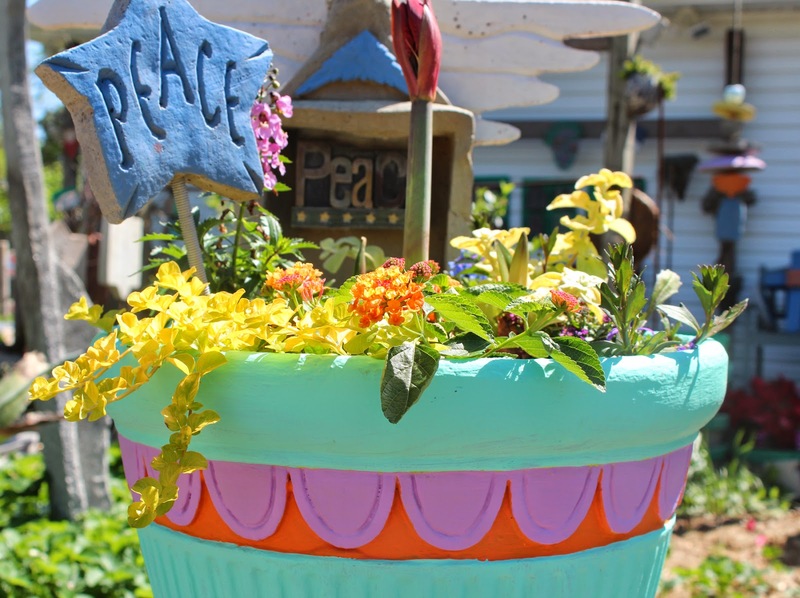 A Garden of Good and...it's just $20! 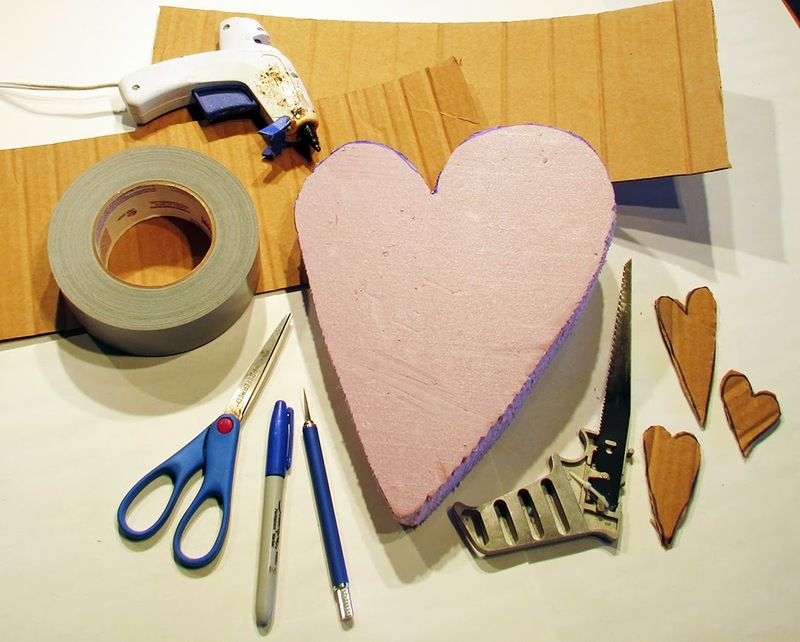 Heart-shaped things are popular so here’s something fun for you to make for your own garden of good. Robin recently visited her brother in Los Angeles. They were fortunate to be able to tour the Mosaic House in Venice Beach. 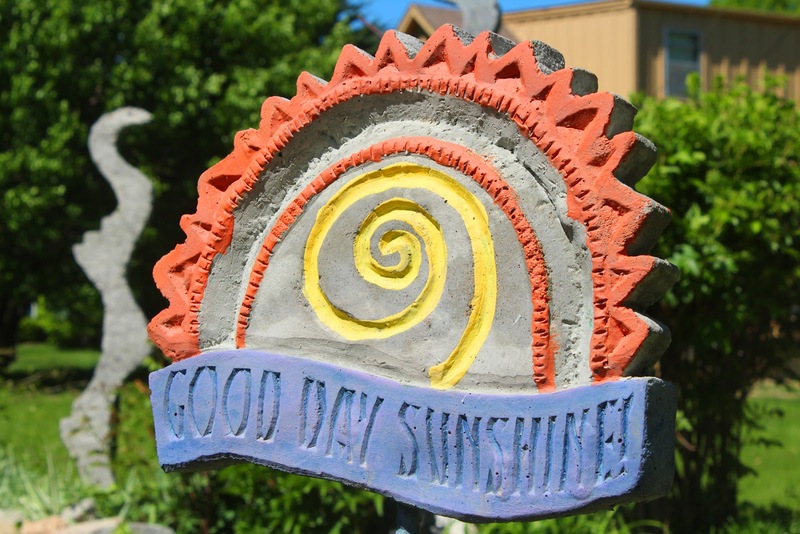 It is a spectacular home owned by a couple of artists, age 74 and 83. 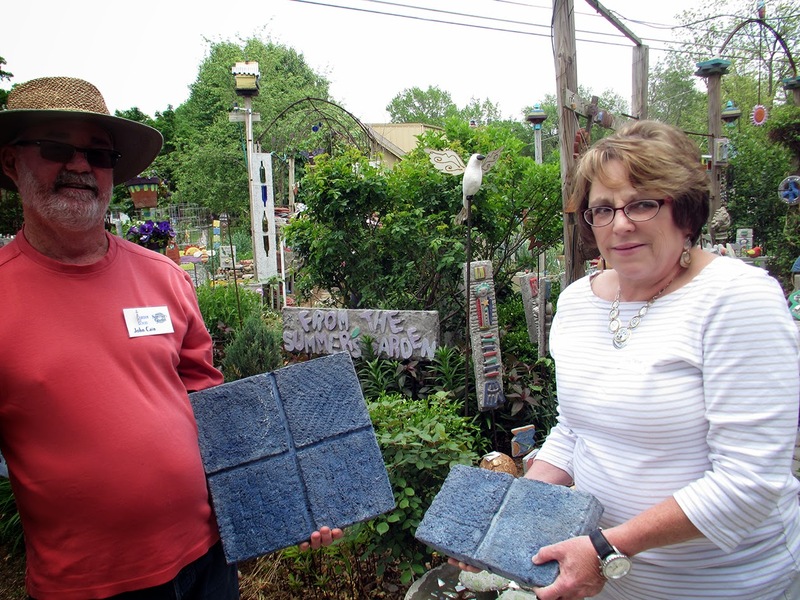 Inspired by their visit, they returned to her brother's home, dug through his broken tile stash and wood pile. 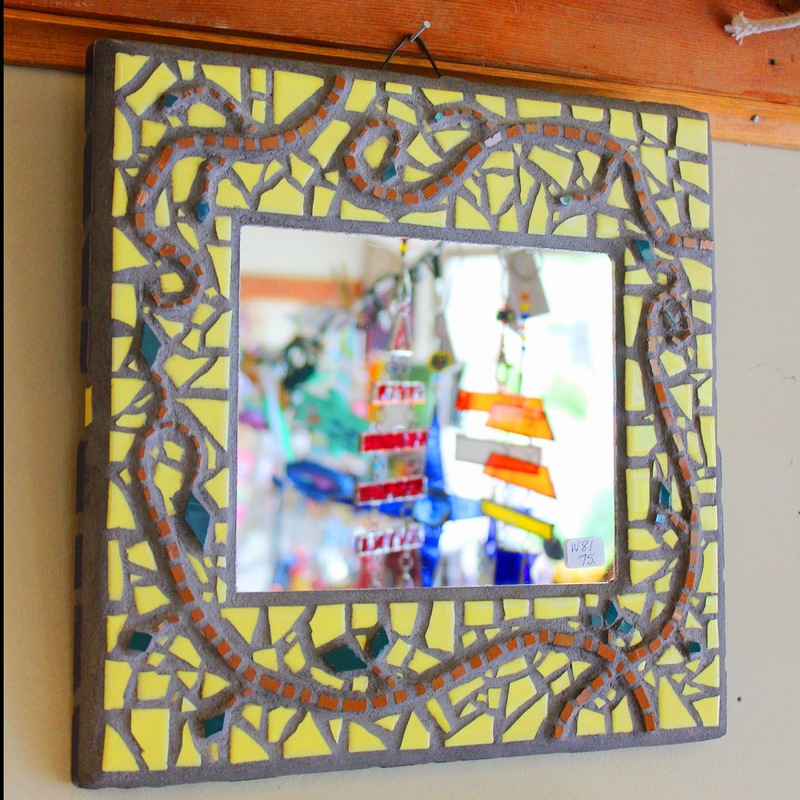 Each created a homage to the Mosaic House, Robin's is this beautiful mirror. 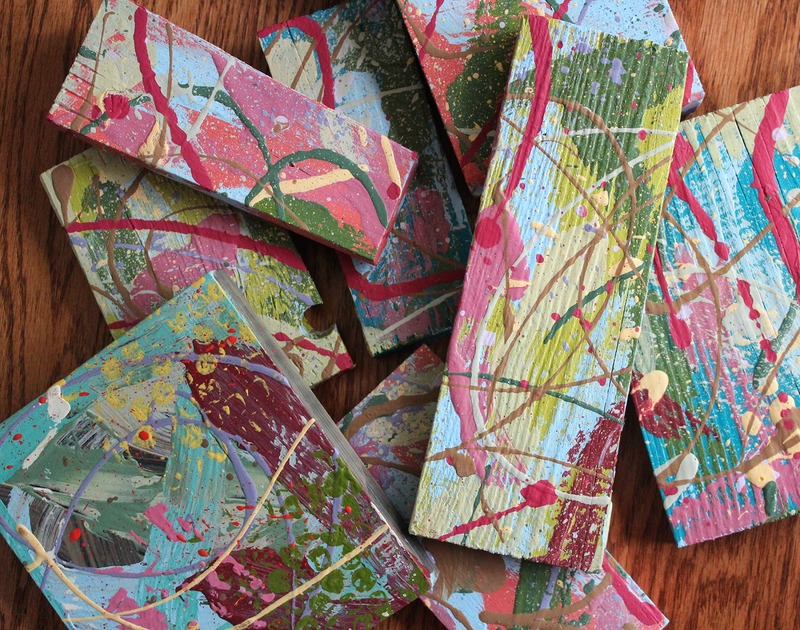 Everything used in the piece is recycled. 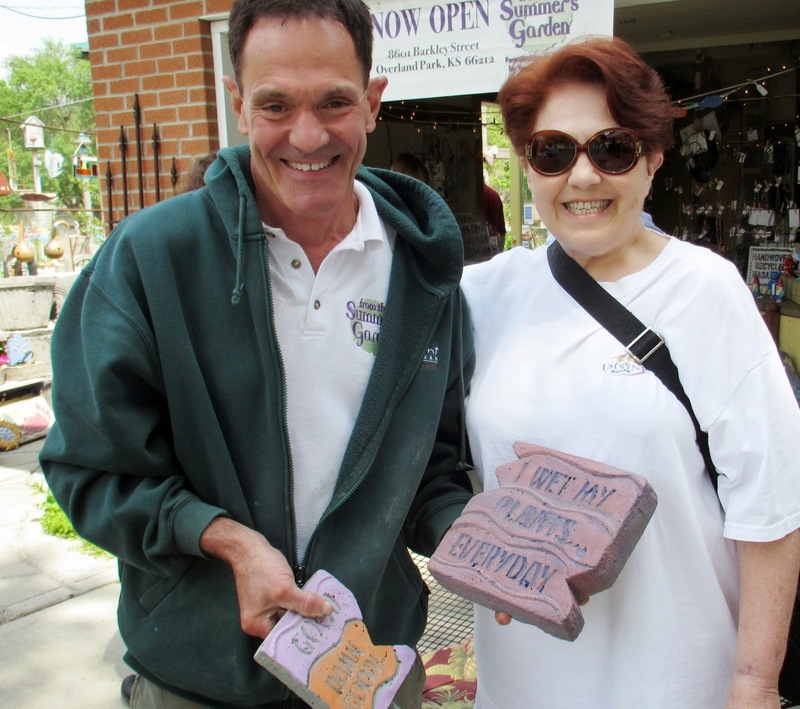 My favorite business partner is Halings Nursery. 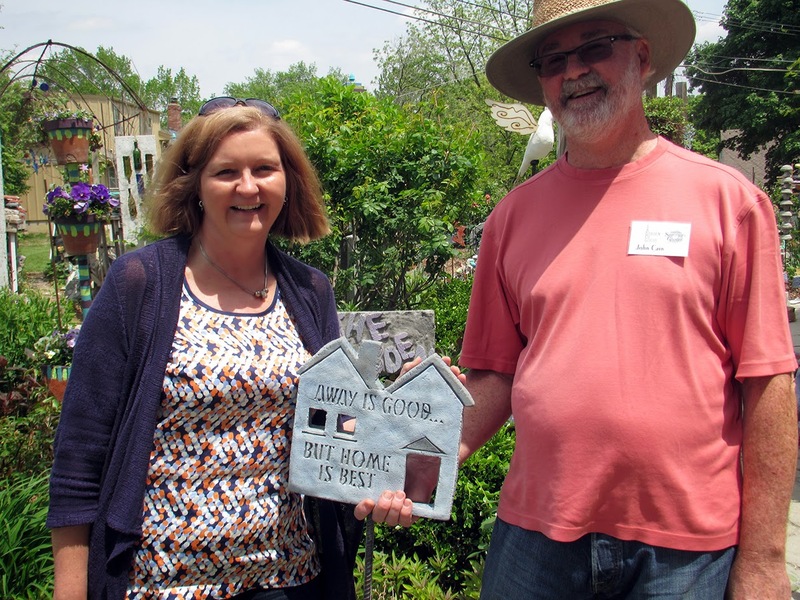 Each year we make a bid to create a space a the KS Symphony Designer's Showhouse. 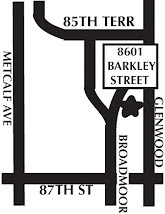 This coming weekend is the last one for this year's show house. If you haven't seen it yet, you should. It is the most well-put-together house I've seen on this tour in a long time. Our patio is out in the back. They have made it very difficult to find, but if you persevere you'll find it and believe me, it is worth it! 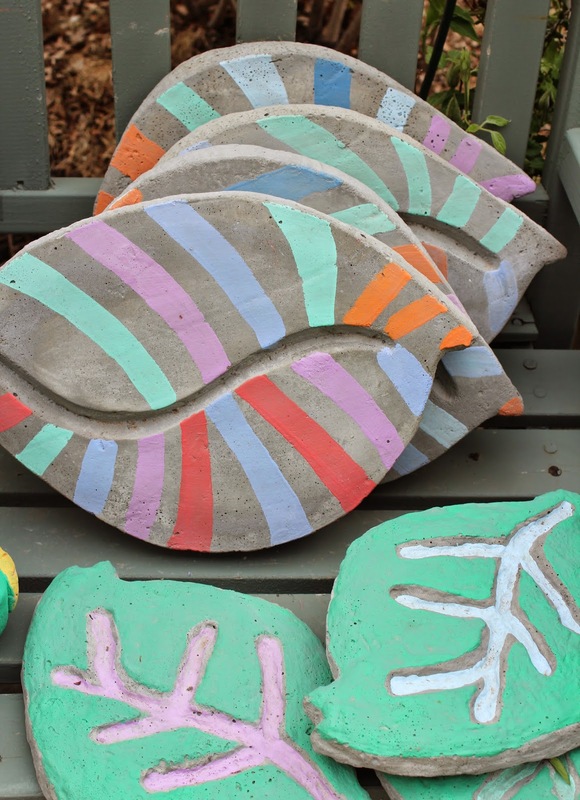 Gardn Studio with LISA FREEMAN: BLOCKS! 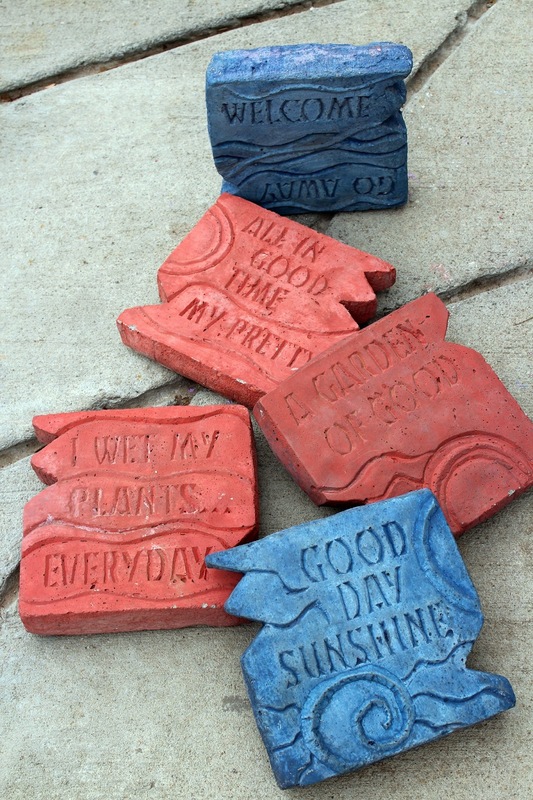 ...and snappy message blocks that can be a garden stone or stand up to make a statement! 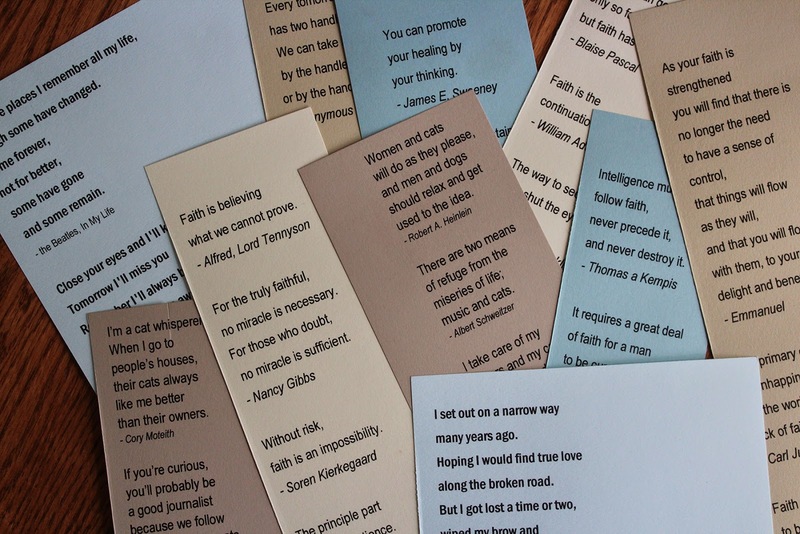 From south20studios wabi-sabi (flawed beauty) tree totems. Made up from one of a kind, hand textured and glazed tubes. 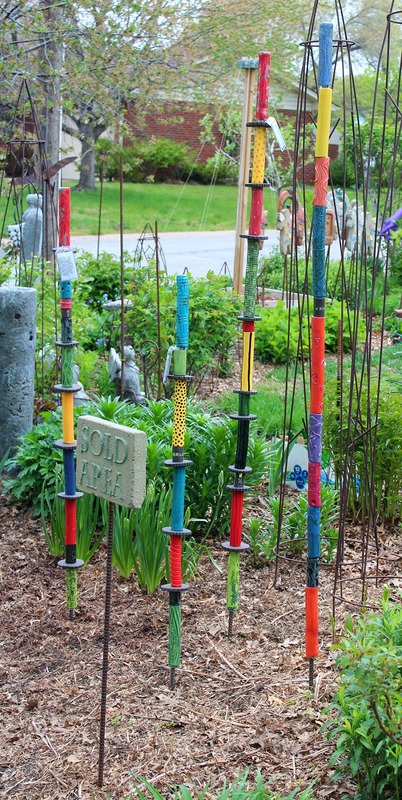 They provide funky, fun color to brighten your garden. They have been high temperature, multi-fired to achieve the surface designs and can remain in place year long. 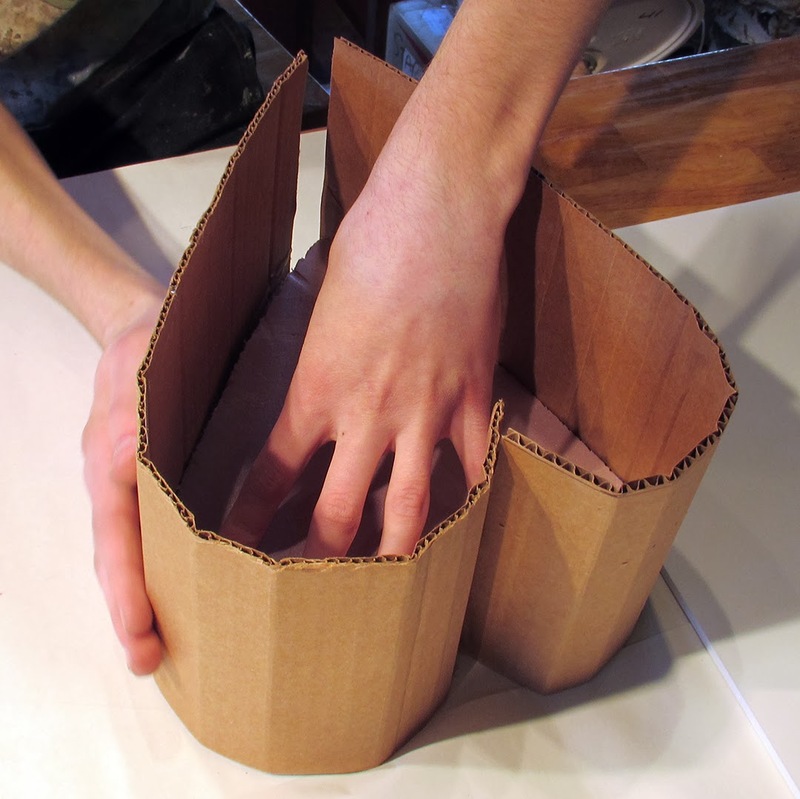 Use them as indoor sculpture by standing in containers. Either way, a wabi-sabi tree can help us to remember to appreciate the flawed beauty and imperfection in everything around us. 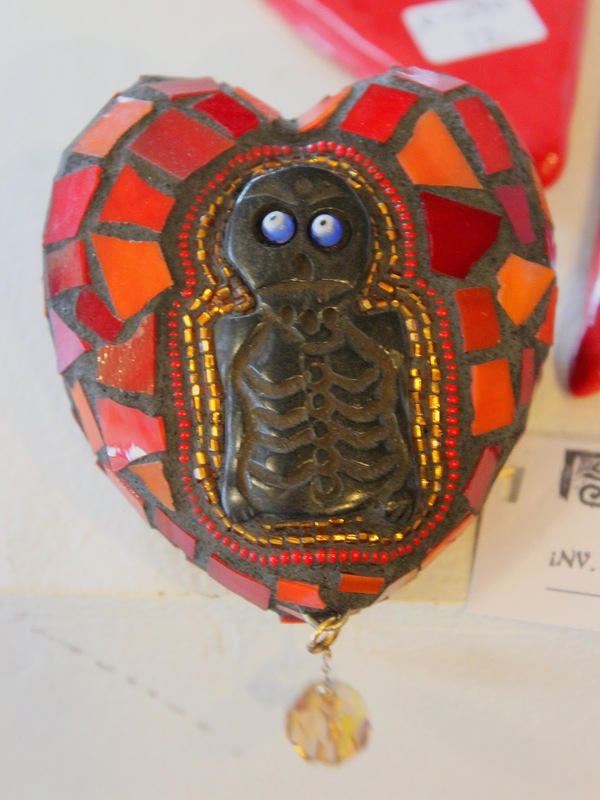 Made with hand cut glass, glass bead, oddities, and coordinating grout. Finished with hanger suitable for hanging on the wall. 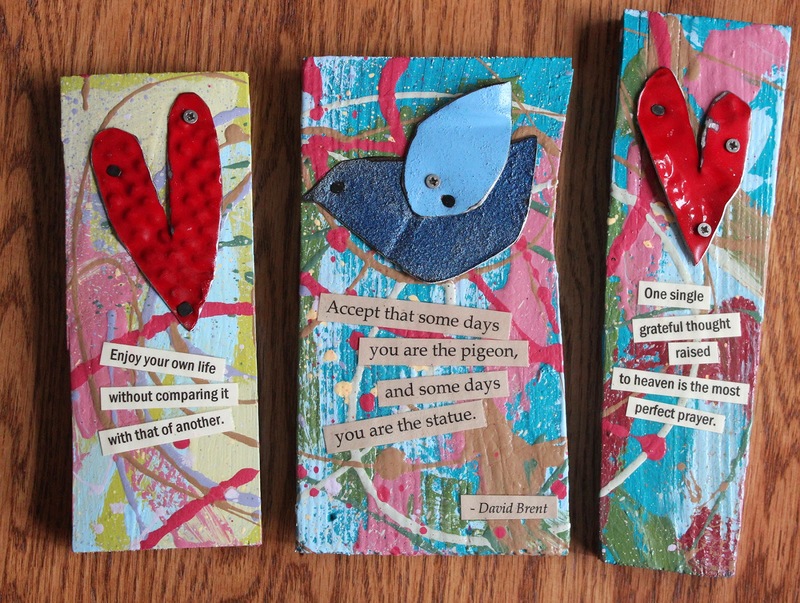 Capture the essence of your loved one ( or the one that shattered your heart)....odd, original, one of a kind! .....and don't forget mom! 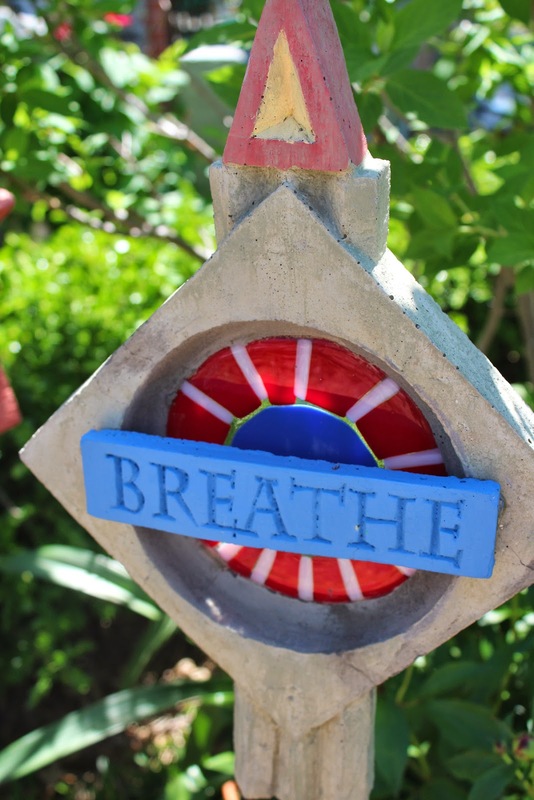 Put together junk yard car hoods and marble collections, and you get these torch cut flowers from LeAnne at south20studios. 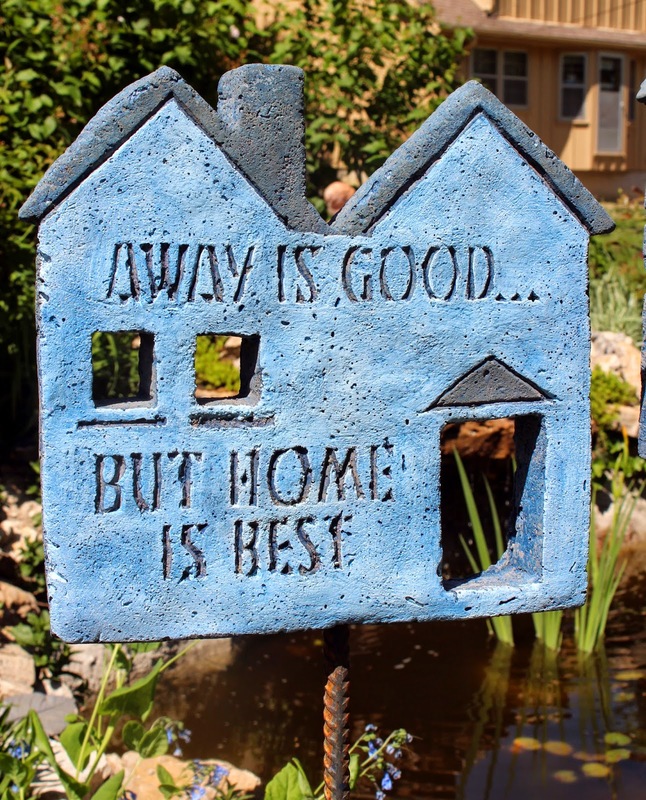 LeAnne walks the junkyard to find the perfect hoods. 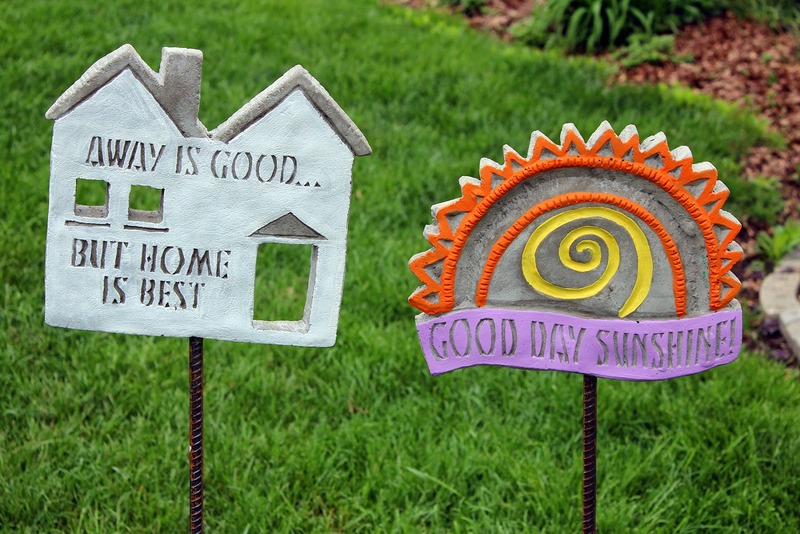 She uses the original color and finishes on the metal. (Sometimes she can even tell you what vehicle they came from!). The metal is free-hand torch cut into flower shapes. 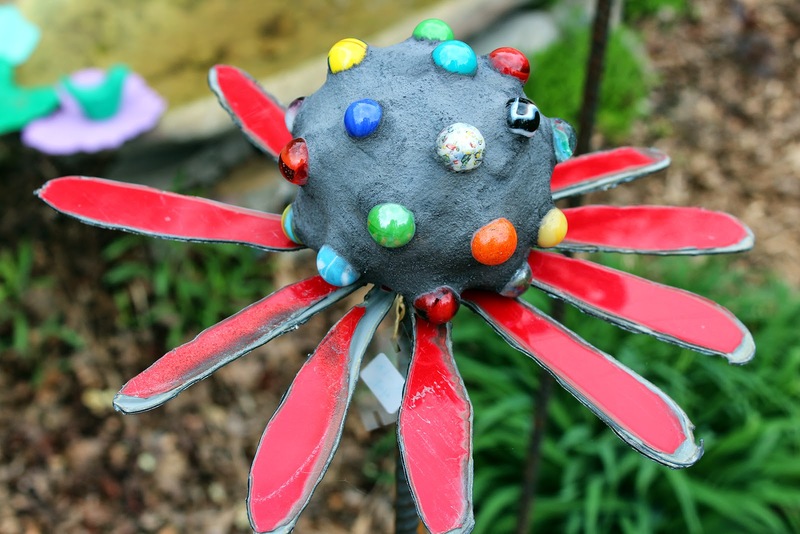 The flower centers are a crazy collection of assorted glass marbles, set in concrete. 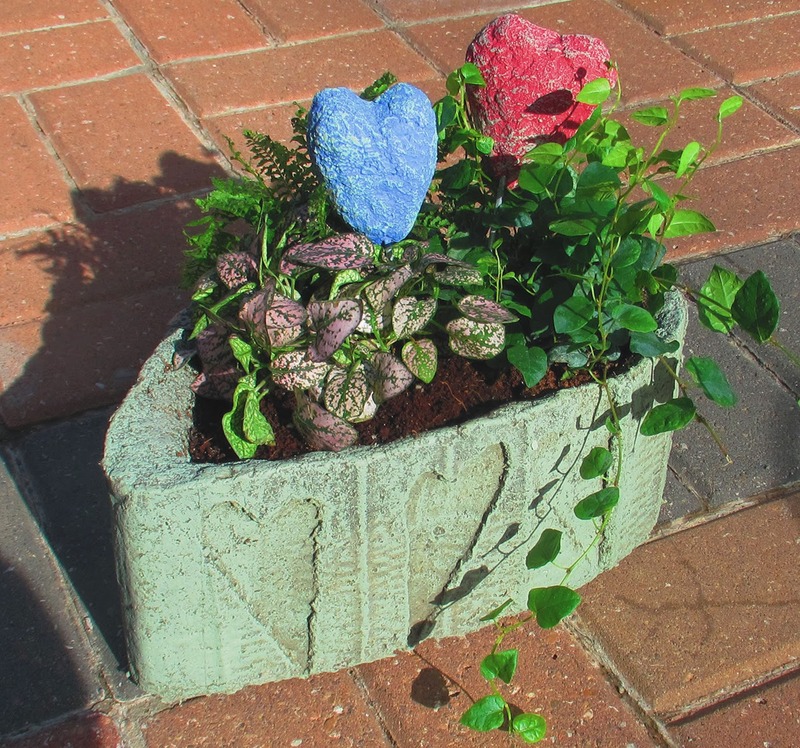 Stake them in garden, or pot them in a planter for a burst of fun and color. 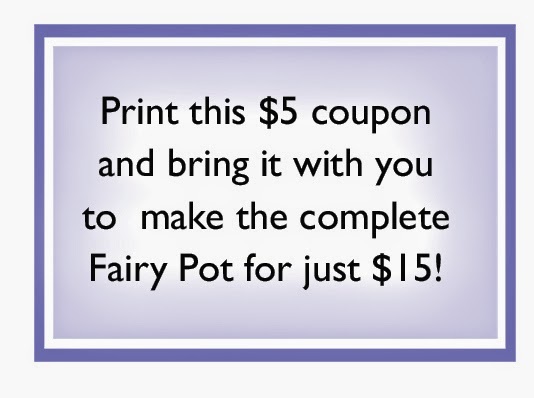 Print out this coupon and bring with you to our special event Saturday May 3 from 1:00-3:00! 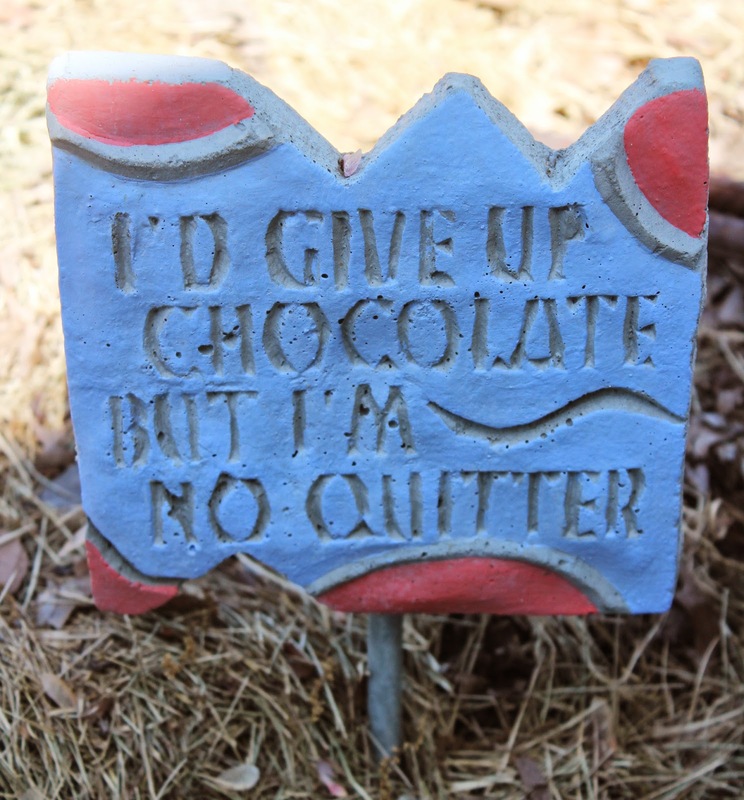 In the nineteenth century, a gift of chocolate was a special treasure ( AS IF IT ISN'T NOW!) and every small European village had a chocolate shop. Chocolate was molded in all shapes and sizes. 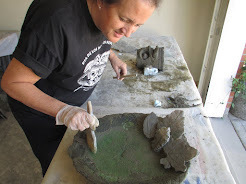 The early molds were hand-hammered over castings created by individual artisans. The sculptor was either commissioned or, in some cases, in the direct employ of the chocolate factory who would provide him with a studio. Some large factories evolved, first in Germany, and later in France and the United States. Casting figurines from molds has been a German tradition since the late 1800’s. 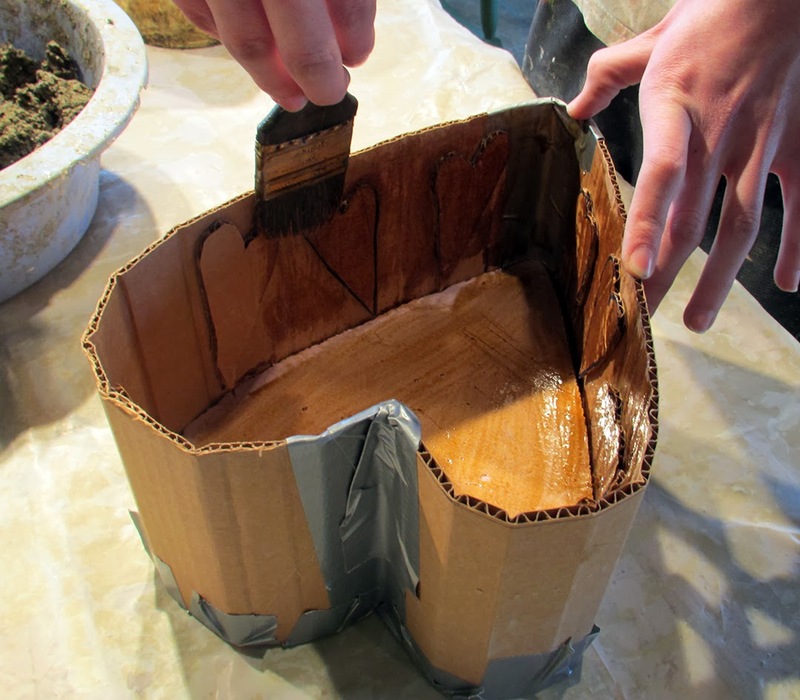 Originally paper mache was pressed into wooden molds and allowed to dry. Some of these hollow pieces were then dipped into plaster, which dried to a smooth, but very fragile finish. 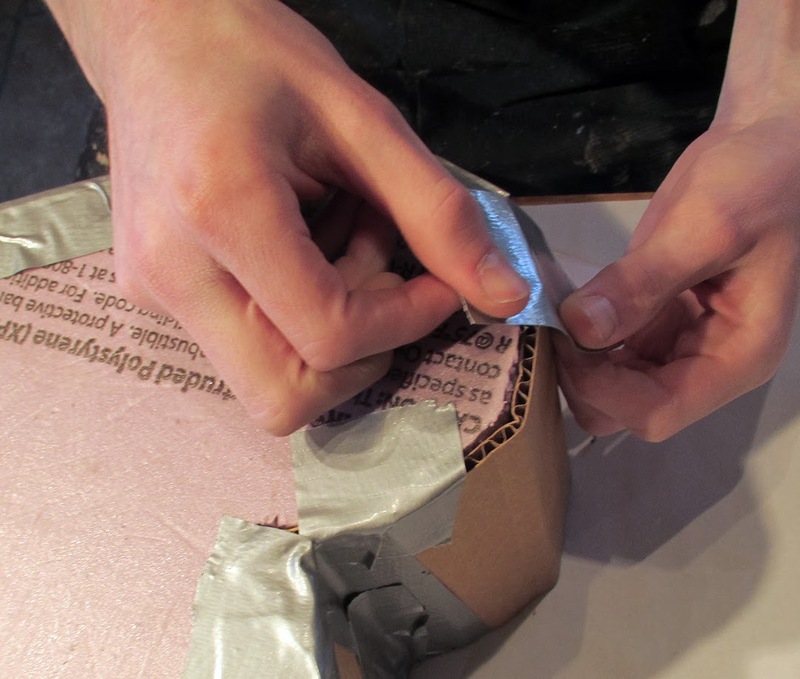 In America, the Pennsylvania Germans substituted solid plaster for paper mache, and often used chocolate molds for the forms. 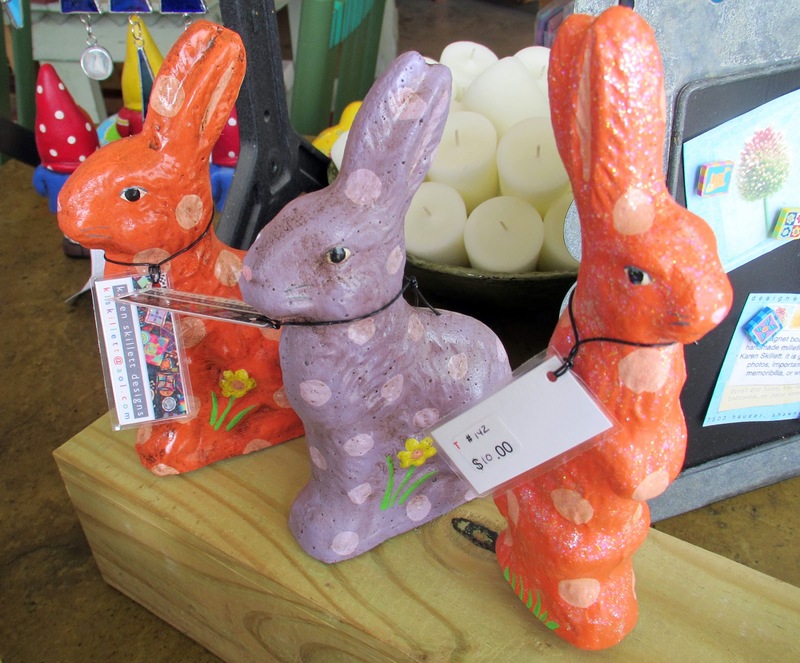 Making “Chalkware” figures using antique chocolate molds continues to this day. 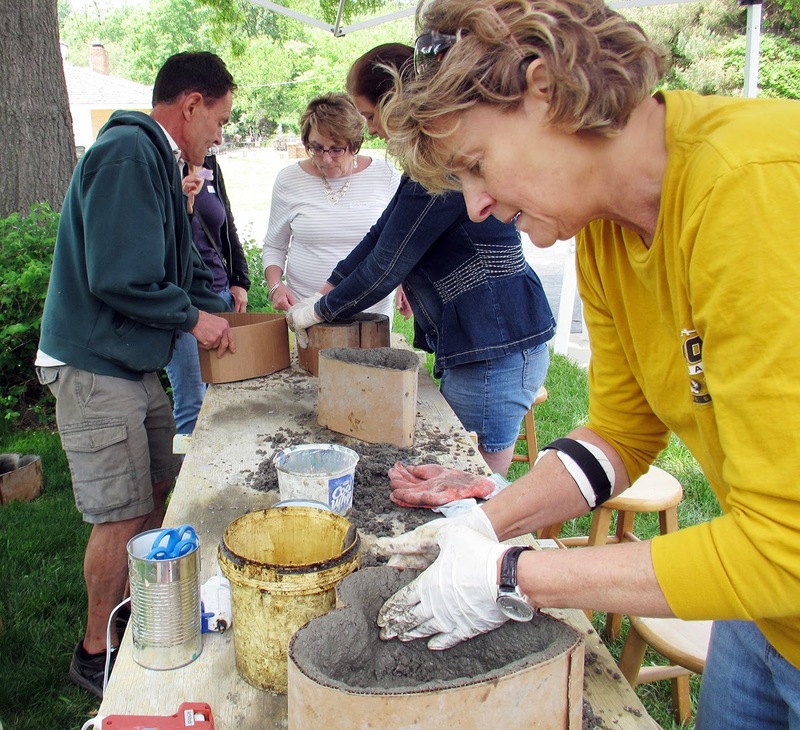 This year, Karen has taken casting using antique chocolate molds one step farther. 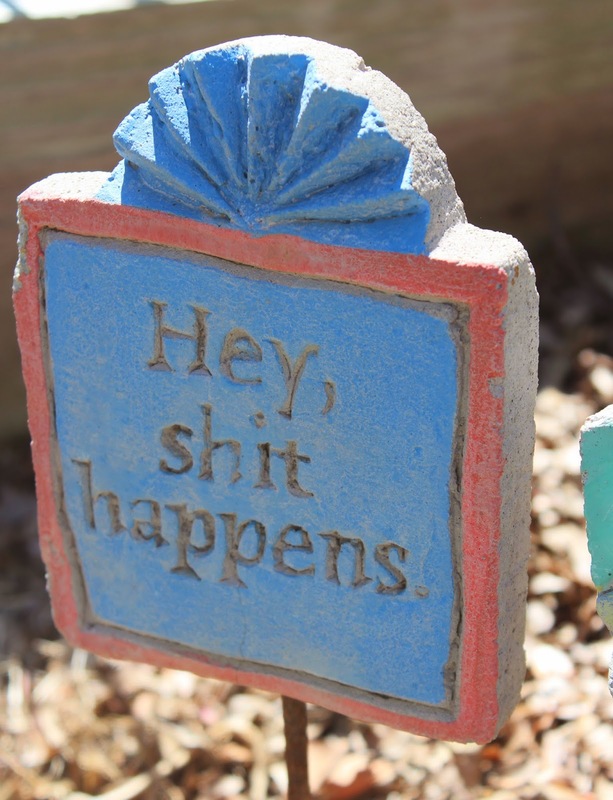 She selects only unique molds, casts them in CONCRETE, and whimsically decorates them, creating beautiful and nostalgic decorations that remind us of our treasured childhood memories. 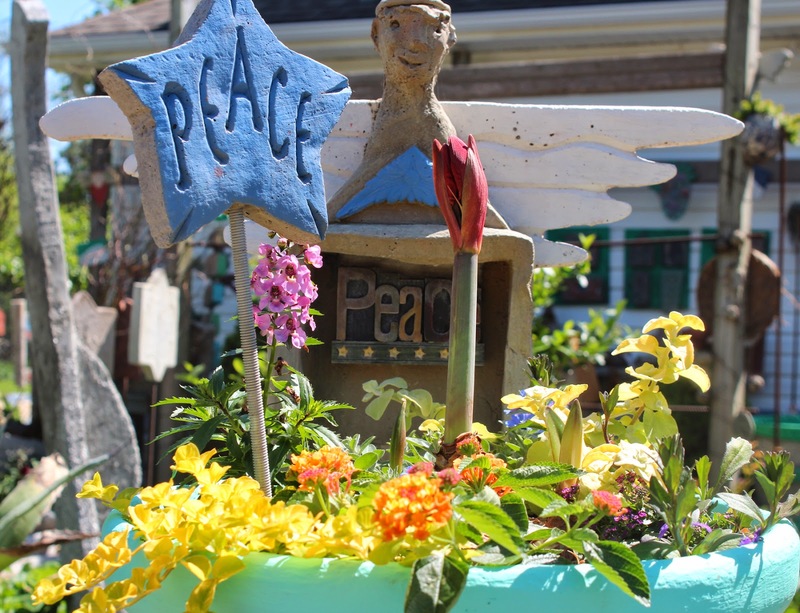 The resulting figurines make wonderful additions in planters and fairy gardens. It is a great deal, so come join us!